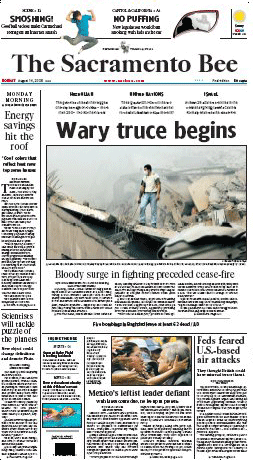 Cool Colors make the front page of The Sacramento Bee (3rd highest circulation newspaper in California) on 14 August 2006! Read the article online or as a PDF. For an introduction to cool roofs, please read our Cool Roof Q+A. Brochures and guidelines on cool roofs are collected on the Cool Roof Resources page of the Federal Energy Management Program. For a quick introduction to the Cool Colors Project, please read our article Cooling Down the House in the March 2005 issue of Professional Roofing. To find cool colored roofing products on the market, please visit the website of The Cool Roof Rating Council. New! Wondering whether a cool colored roof would be cost effective for your home? 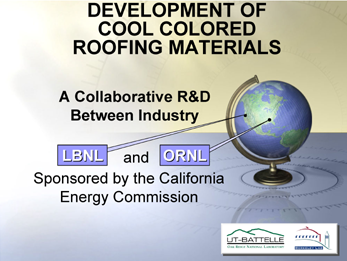 See our May 2006 presentation to the California Energy Commission in which we evaluate the life-cycle cost of cool colored roofing for homes in California's 16 climates. Or, read our detailed draft report. To learn more about other specific topics, please review some of our recent publications and talks, or look at our pigment database. You may direct further questions to Ronnen Levinson or Hashem Akbari in the Heat Island Group at Lawrence Berkeley National Laboratory, or to William Miller or Andre Desjarlais in the Building Envelopes Program at Oak Ridge National Laboratory. R. Levinson, H. Akbari and P. Berdahl. 2010. Measuring solar reflectancePart I: defining a metric that accurately predicts solar heat gain. Solar Energy 84, 1717-1744. R. Levinson, H. Akbari and P. Berdahl. 2010. Measuring solar reflectancePart II: review of practical methods. Solar Energy 84, 1745-1759. Levinson, R., H. Akbari, P. Berdahl, K.Wood, W. Skilton, and J. Petersheim. 2010. A novel technique for the production of cool colored concrete tile and asphalt shingle roofing products. Solar Energy Materials & Solar Cells 94, 946-954. S. Menon, H. Akbari, S. Mahanama, I. Sednev and R. Levinson. 2010. Radiative forcing and temperature response to changes in urban albedos and associated CO2 offsets. Environ. Res. Lett. 5 014005 (11pp) doi: 10.1088/1748-9326/5/1/014005 . R. Levinson and H. Akbari. 2010. Potential benefits of cool roofs on commercial buildings: conserving energy, saving money, and reducing emission of greenhouse gases and air pollutants. Energy Efficiency, 3 (1), 53-109. Bonus: map of the ratio of mean global horizontal solar irradiance in winter to that in summer [format: PDF], illustrating how the northern mainland U.S. (latitude >= 40°N) receives 3 to 5 times as much daily sunlight in summer as in winter. Map © 2009 Ronnen Levinson, Lawrence Berkeley National Laboratory; based on NREL TMY2 weatherfiles. Barringer, F. 2009. By degrees - white roofs catch on as energy cost cutters. The New York Times, July 30, p.1. Bonus: Imagining a Cool-Roof Nation (article graphic reporting Berkeley Lab research). R. Levinson. 2009. Advances in measuring solar reflectanceor, why that roof isn't as cool as you thought it was. Presented to Environmental Energy Technologies Division, Lawrence Berkeley National Lab, Berkeley, CA, Jun. 30. H. Akbari and A. Rosenfeld. 2009. Cool roofs could save money, save planet [format: online transcript & video link]. KGO-TV (abc7news), March 3. A. Rosenfeld. 2009. Painting the town white: California Energy Commissioner Art Rosenfeld explains the benefits of cool roofs [format: online transcript & audio link]. Living on Earth, National Public Radio, February 13. H. Akbari. 2009. Hashem Akbari speaks to BBC Radio World Service about global cooling (Newshour 2000 GMT, 2009-01-18) [format: MP3]. H. Akbari, S. Menon and A. Rosenfeld. 2009. Global cooling: increasing world-wide urban albedos to offset CO2. Climatic Change, 94, pp. 275-286. H. Akbari and A. Rosenfeld. 2008. White roofs cool the world, directly offset CO2 and delay global warming. Berkeley Lab Heat Island Group Research Highlight, Nov 10. H. Akbari, S. Menon and A. Rosenfeld. 2008. Equivalent CO2 avoided by reflective roofs and pavements in California. A memo to Dr. Bart Croes (California Air Resources Board). Revised Oct 21. H. Akbari and R. Levinson. 2008. Evolution of cool-roof standards in the US [format: PDF]. Advances in Building Energy Research, 2, pp.1-32. Posted by permission of publisher; also available from Earthscan here. H. Akbari, C. Wray, T. Xu and R. Levinson. 2006. Inclusion of solar reflectance and thermal emittance prescriptive requirements for residential roofs in Title 24 [format: PDF]. Draft report presented at the California Energy Commission workshop on 2008 Building Energy Efficiency Standards, Sacramento, CA, May 19. Also available: a presentation [format: PDF] summarizing this report. H. Akbari, C. Wray, T. Xu and R. Levinson. 2006. Inclusion of solar reflectance and thermal emittance prescriptive requirements for steep-sloped nonresidential roofs in Title 24 [format: PDF]. 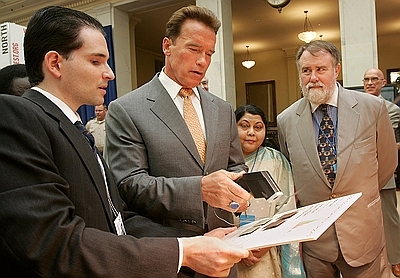 Draft report presented at the California Energy Commission workshop on 2008 Building Energy Efficiency Standards, Sacramento, CA, May 19. Also available: a presentation [format: PDF] summarizing this report. R. Levinson, P. Berdahl and H. Akbari. 2005. Solar spectral properties of pigments, or how to design a cool nonwhite coating [format: PDF]. Presented at Cool RoofingCutting Through the Glare, Atlanta, GA, May 12. H. Akbari, R. Levinson and P. Berdahl. 2005. Review of residential roofing materials, Part I: a review of methods for the manufacture of residential roofing materials [format: PDF]. Western Roofing Insulation and Siding. Jan/Feb, pp. 54-57. H. Akbari, R. Levinson and P. Berdahl. 2005. Review of residential roofing materials, Part II: a review of methods for the manufacture of residential roofing materials [format: PDF]. Western Roofing Insulation and Siding. Mar/Apr, pp. 52-58. H. Akbari and A. Desjarlais. 2005. Cooling down the house: residential roofing products soon will boast "cool" surfaces [format: HTML]. Professional Roofing. March, pp.32-38. W. Miller et al. 2004. Special Infrared Reflective Pigments Make Dark Roofs Reflect Almost Like White Roofs [format: PPT]. Presented at Performance of Exterior Envelopes of Whole Buildings IX, Clearwater Beach, FL, Dec. 9. R. Levinson. 2004. Cool Colors for Summer: Characterizing the Radiative Properties of Pigments for Cool Roofs [format: PDF]. Seminar presented at Lawrence Berkeley National Lab, Berkeley, CA, Apr. 22. J. Field. 2001. Berkeley Lab Pioneers Energy-Efficient Technologies. KQED California Report radio interview with Ronnen Levinson, June 8. Note: PDF files can be viewed with the free Adobe Acrobat Reader. It is best to save the PDF file to your local disk, then open the saved file with Acrobat Reader. Viewing PDF files in your web browser (e.g., Firefox or Internet Explorer) is suboptimal. The solar spectral radiative properties of conventional and cool pigmented coatings are described in the LBNL Pigment Database.